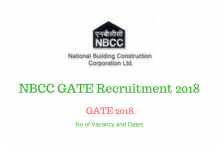 NBCC (National Buildings Construction Corporation) will release the admission notification for NBCC GATE Recruitment 2018. 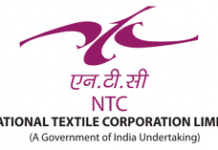 The candidates will be recruited for the post of Management Trainee. 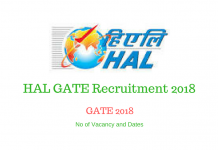 The aspirants who will appear in GATE 2018 Examination will only be eligible for the recruitment. The application form will be available for the aspirants in the Last Week of December 2017 and the deadline for the submission of application form will be in the Last Week of January 2018. The aspiring candidates should read the article below for complete details related to NBCC GATE Recruitment 2018. Firstly, NBCC will release the application form for the recruitment of the aspirants on the official website of National Buildings Construction Corporation. Then, the candidates can fill the online application form for the same after its availability. Also, at the time of registration, the applicants need to provide their GATE Registration Number. Then, the candidates need to fill all the necessary details in the application form. Also, they should upload their recent photograph and signature in the specified format, dimensions, and size. Also, the aspirants must provide their GATE 2018 Score Card. Further, they need to submit the application form after successfully filling all the necessary details in the application form. Finally, after submission, the applicants must download and take a print of the application form, and keep it safe for future reference. Stay tuned with EntranceZone for more updates and information related to NBCC GATE Recruitment 2018.